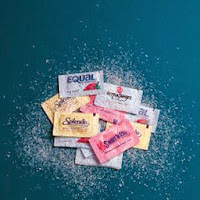 Artificial sweeteners - Could they really be less toxic and obesogenic than half of the blogosphere has it? The study at hand suggests so, but its significance is limited.. The recently posted SuppVersity Classic "Sweet, But Not Innocent!? The Fattening Effects of the Non - Nutritive Sweeteners Erythritol & Aspartame Are On Par With Equally Sweet Sugar Water" (read more) has gotten quite some attention on Facebook, against that background I suppose that today's SuppVersity article will, once more inflame passions. The use of artificial sweeteners as dieting aids is after all highly controversial within the health and fitness community. If you've read my previous reviews of the corresponding papers, you will yet be aware that there is not a single human study to confirm that any of the "classic" artificial sweeteners (sucralose, aspartame & co) would have negative effects on the loss of body and fat mass during dietary restriction - an still you hear and read corresponding claims on almost every virtual corner of the blogosphere. Sucralose Raises Cholesterol in Diabetics!? In this respect, the latest paper by Lone B Sørensen, Tatjana H Vasilaras, Arne Astrup, and Anne Raben is no exception. What is extraordinary, though, is that it describes a relatively tightly controlled single-blind 10-week parallel design study that provides convincing evidence that the association between artificial sweetener consumption and obesity that has been observed in epidemiological studies would be a good example to explain the term "reverse causation" [fat people buy diet products vs. diet products make lean people fat]. In the said study, 24 healthy, overweight subjects had to consume a specific minimum amount of either sucrose-sweetened or artificially sweetened foods and drinks daily. "The subjects were assigned to 3 different levels of supplements according to their initial body weight: level 1, 2, or 3 corresponding to 60–75, 75–90, and.90 kg, respectively. The minimum intake of the experimental diet was regulated by the sucrose intake and corresponded to a sucrose intake of 125 g/d (level 1), 150 g/d (level 2), and 175 g/d (level 3). This corresponded to a total EI from sucrose supplements of 2.74, 3.29, and 3.83 MJ/d, respectively." The sweetener group received an equivalent amount (by weight) of foods and drinks, which resulted in an average EI of 694, 832, or 971 kJ/d at levels 1, 2, and 3, respectively. The artificial sweetener content of the intervention diet was 54% aspartame, 23% cyclamate, 22% acesulfame K, and 1% saccharin. No low fat allowed: Some of the artificially sweetened products were low fat, so the subjects in the sweetener group were given additional butter or corn oil to keep the fat intake in the 2 intervention diets as similar as possible. In the sucrose group, ~70% of the sucrose came from drinks (average: ~1.3 L/d), and ~30% came from solids foods. About 80% by weight of the supplements were beverages, and ~20% by weight were solid foods. The beverages consisted of several soft drinks and fruit juices, and the solid foods consisted of yogurt, marmalade, ice cream, and stewed fruit. The products were handed to all participants at the University without informing them about the specific content of sucrose and artificial sweeteners in the supplemented products was unknown to the subjects - all thought, they were consuming products with artificial sweeteners. Otherwise, they were advised to to consume their habitual diet ad libitum. And guess what happened!? Figure 1: Changes in body weight and fat mass (kg) and energy intake (in MJ) during breakfast, lunch and dinner measured on the one day all subjects had to spend in a metabolic ward (Sorensen.2014). Yep, you already saw it, the sugar victims (sucrose sweetened products) got fat, while the subjects who had been supplied with artificially sweetened products saw small, bus significant improvements in their body composition without deliberately restricting their energy intake (Remember: all subjects thought that they were consuming zero calorie products). The reason? Well, take a look at the left hand side of Figure 1. The subjects in the sucrose group did what some people claim would happen, if you consume artificially sweetened products: They ate more! Why? Well, because they were hungrier. Significantly hungrier; and that in spite of their 22% higher energy intake. 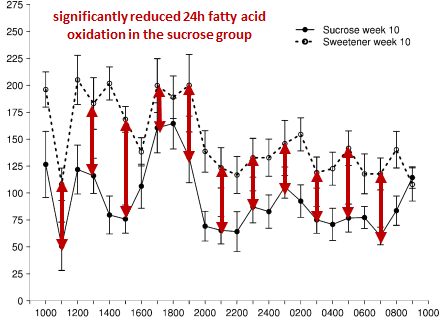 Figure 2: The satiety response at lunch was (non significantly) less sustained in the sucrose group (full circles) compared to the artificial sweetener group (open circles) during the subjects visit at the metabolic ward (Sorensen. 2014). Especially after lunch, the satiety effects were significantly less sustained than in the artificial sweetener group (see Figure 2). What is interesting, though, is the fact that unlike its consequences and the perceived fullness and prospective food consumption (not shown in Figure 2), the satiety difference did not reach statistical significance. The data in Figure 1 did already tell you: The net effect of the satiety differences was a significantly higher energy intake (+22%) that was not fully compensated by the ca. 6% higher total 24h energy expenditure of the subjects in the sucrose group. In concert with the reduced fatty acid oxidation rates (see Figure 3) the remaining energy surplus of approx. 1,000kcal (that's the mere mathematical difference of total 24h energy expenditure during the stay at the metabolic ward and the corresponding energy intake) was obviously more than enough to fatten the subjects up. There is one impor- tant reason why I still recommend to be careful with any kind of sweetener (inclu- ding stevia) and that's the fact that they won't help people get rid of their extra-sweet tooth. A "tooth" which is in many cases the reason they ran into weight problems in the first place. And a tooth that is rather going to get more, not less sugar hungry if you are adding stevia, sucralose or aspartame to whatever foods you eat. Putting the results into perspective: What this study does confirm is that artificially sweetened products can help average healthy non-dieting, non-overweight individuals lose weight. What it does not confirm is that artificially sweetened products will help obese people lose weight or ward off further weight gain in an ad libitum diet scenario such as the one at hand. If we go one step further and extend our skepticism from a potential subject- to a potential duration-specific effect, we still don't know if the chronic consumption of artificially sweetened products wouldn't have negative effects on what some people call the "energy intake gauge". Or, put differently, whether the constant exposure to no-calorie foods with an extreme sweetness would not - in the long term - reduce the satiety the subjects in the artificial sweetener group obviously felt after consuming their diet products. If that was the case, the "energy deficit" would disappear and the short term benefits would eventually turn against you. Sørensen, Lone B., et al. "Sucrose compared with artificial sweeteners: a clinical intervention study of effects on energy intake, appetite, and energy expenditure after 10 wk of supplementation in overweight subjects." 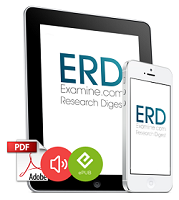 The American journal of clinical nutrition (2014): ajcn-081554.